Total Living: 5,013 sq. 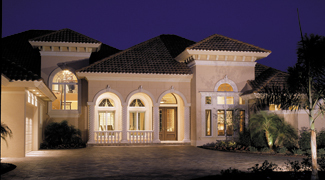 ft.
Arches and simple lines dominate the classic Mediterranean architecture of this home, while corbels, banding, and hipped and pavilion roofs provide visual excitement. A wide curving driveway leads graciously to a side-entry garage, and the cozy front porch welcomes guests with classic railings and double doors leading to a stately foyer. 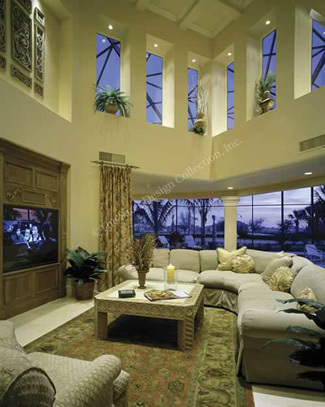 Natural light streams into the leisure room through zero-corner sliding glass doors and a second story band of vertical windows, opening up this room to the outdoors. Just steps from the wet bar, living room and kitchen, the dining room is the focal point for formal dinners and special-occasion Sunday brunches.